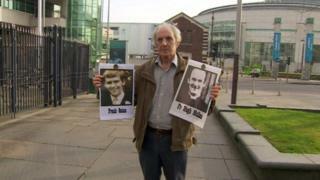 Eilish Meehan said people had gone to an Army to "ask for protection". "That never came, but we were shot at and nobody had a clue why," she said. Ms Meehan said someone shouted "they are coming in", in reference to loyalists in Springmartin, and there was a single shotgun blast, which she described as a "warning shot". Ms Meehan described the main shooting event that evening as "crossfire" with shots coming from two directions, including from people lying on top of flats in Springmartin. She described a "sense of disbelief" when she heard that local priest, 38-year-old Fr Mullan, had been shot. "There was panic... you don't shoot a priest, we thought we were going to be overrun, massacred," she said. "I thought it was loyalists were firing on us. "Now I think it was a mixture of loyalists and security forces mainly because of the type of the weapons being used. At that time there was a lot of gunfire, you got to know the different types of rifle fire."